Dodoma — AT least 70 countries have confirmed to attend this year's great Union Day celebrations which will be marked in Dodoma, the country's capital city for the first time. The Minister of State in the Prime Minister's Office (Policy, Parliamentary Affairs, Labour, Employment, Youth and the Disabled), Ms Jenista Mhagama announced here yesterday that preparations are at advanced stage at the venue-Jamhuri Stadium, where she was witnessing the progress. In her entourage was the Prime Minister Mr Kassim Majaliwa, where the organisers said they are 100 per cent ready for the event on Thursday April 26, 2018. Details from the Minister indicated that the country's 54th celebrations will also be presided over members of the East African Legislative Assembly (EALA) whose session is ongoing in Dodoma for the first time in history. "The National Assembly Speaker, Job Ndugai is placed to host his counterpart speakers of the EALA as well as Zanzibar's House of Representatives. It will be a new experience where not only leaders from EAC would attend, but also Members of Parliament here to celebrate with us," she said. She called upon the public to turn up in big numbers from countrywide regions as well as those from other nations to join in marking the historic event, that enabled Tanganyika and Zanzibar to unite, and has ensured peace and security in the country. 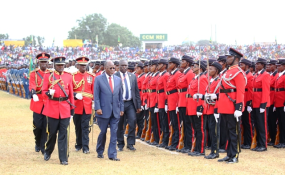 The event that will be graced by President Dr John Magufuli, the Minister said this year, the Prison force will showcase its professional tactics on how they protect prisoners and control riots in their institutions. "As we always have surprises, our very own Mzee Cosmus Kidumle will entertain in the celebrations with traditional dances, and pupils," she pointed out. A spot survey in Dodoma showed Tanzania flag flying with decorations nearly in the entire major roads and at the Jamhuri grounds in particular, preparations were ongoing coloured with both the country and East African flags in almost every corner. Dodoma authorities said they have heightened security to ensure that there will be no interruptions to intefere the planned public holiday. Meanwhile, President Magufuli arrived in Dodoma on Sunday to attend a number of meetings including addressing the EALA meeting.